An MQ-9 Reaper assigned to the 432nd Wing/432nd Air Expeditionary Wing rests on the flightline as a A-10 Thunderbolt II flies overhead at the 2017 Aviation Nation Air and space Expo, Nov. 10, 2017, at Nellis Air Force Base, Nev. More than 165,000 spectators attended the event and celebrated the U.S. Air Force’s 70th birthday. 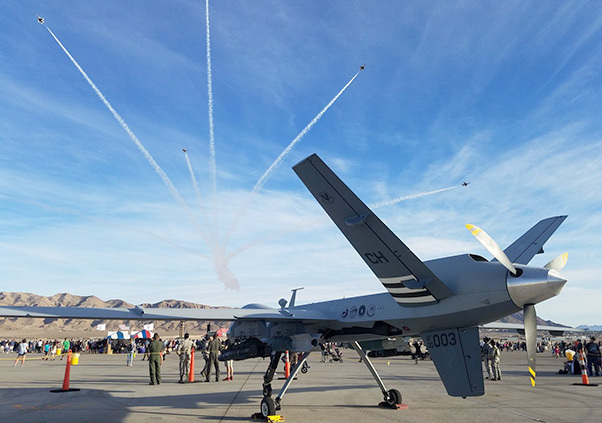 Creech Airmen attend air shows in order to expand public knowledge of the MQ-1 and the MQ-9, as well as, explain how overseas remotely piloted aircraft combat operations are 24/7/365. 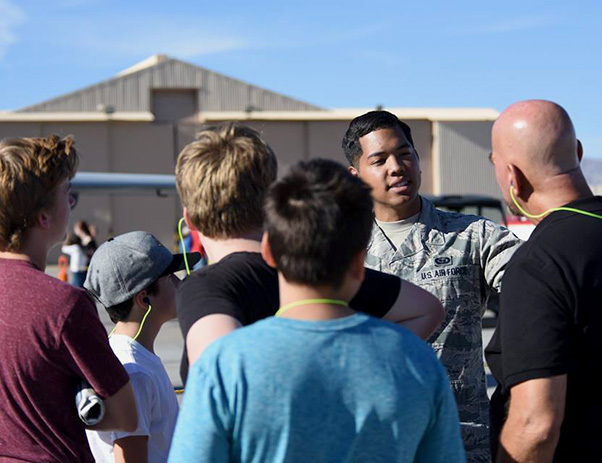 “It’s a good opportunity to get the RPAs to the public to showcase what they really are and to dispel common misconceptions,” said Maj. Richard, 432nd Operations Support Squadron pilot. 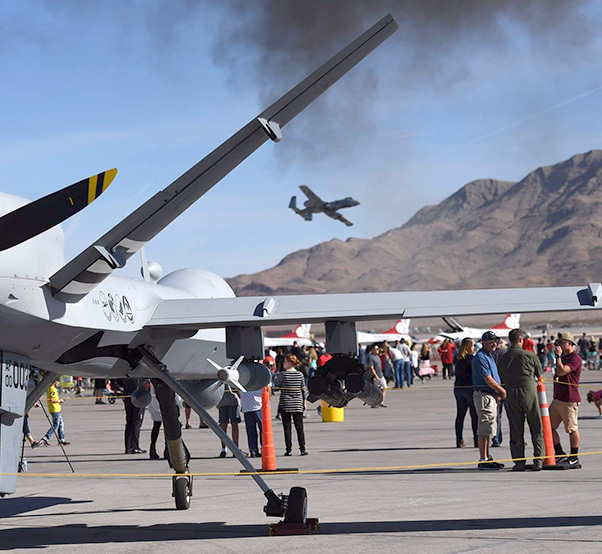 The MQ-1 and MQ-9 were showcased at Aviation Nation together this year. Though surrounded by faster and larger aircraft, the combat remotely piloted aircraft demanded the interest of many Expo visitors. 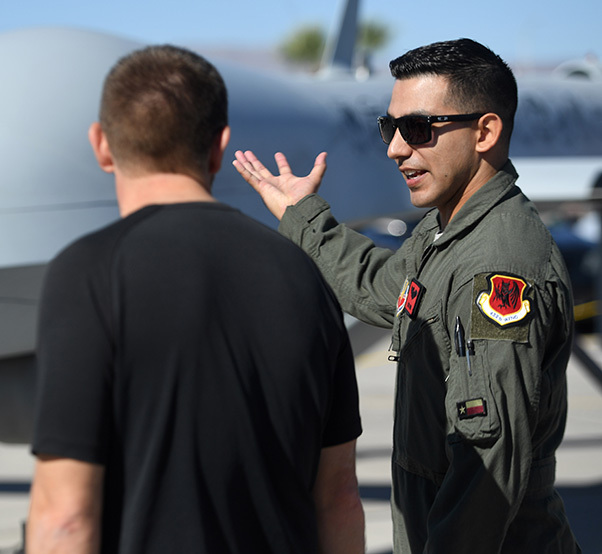 An Airman assigned to the 432nd Wing/432nd Air Expeditionary Wing speaks to attendees about the MQ-1 Predator and an MQ-9 Reaper at the 2017 Aviation Nation Air and space Expo, Nov. 10-12, 2017, at Nellis Air Force Base, Nev.
For many who made their way to the Predator and Reaper, it was their first time learning about their capabilities. Some were surprised to learn aircrews fly MQ-1 and MQ-9 missions in combat from within the continental United States. 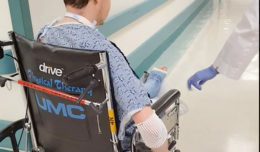 “A lot of people know about Nellis and what they do, but most don’t know about the amazing things we get to witness and be involved in at Creech,” said Airman 1st Class Dequandre, 22nd Attack Squadron intelligence analyst. An MQ-9 Reaper assigned to the 432nd Wing/432nd Air Expeditionary Wing sits on the flightline as the U.S. Air Force Thunderbirds fly overhead at the 2017 Aviation Nation Air and space Expo, Nov. 11, 2017, at Nellis Air Force Base, Nev. The two day event showcased some of the Air Force’s premier aircraft and personnel dedicated to air superiority and served as the closing ceremony for the 70th birthday anniversary. 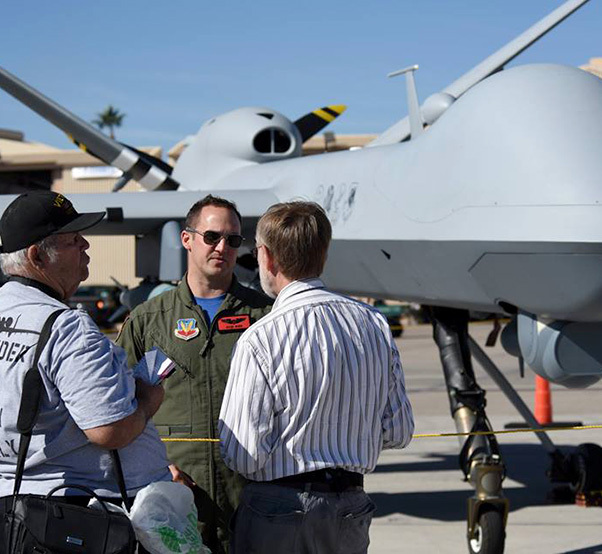 Most Aviation Nation attendees who stopped by the RPA display expressed that they were impressed by how the Air Force has combined traditional and remotely piloted aircraft to contribute to the fight against terrorism. The freshly painted Vegas Strong and Air Force 70th Anniversary F-15 was also among the aircraft displays at Nellis. Visitors witnessed performances by the Texas Flying Legends, Vicky Benzing and the Air Force Thunderbirds. An Airman assigned to the 432nd Wing/432nd Air Expeditionary Wing speaks on the MQ-9 Reaper displayed at the 2017 Aviation Nation Air and space Expo, Nov. 10, 2017, at Nellis Air Force Base, Nev. The event showcased some of the Air Force’s premier aircraft and personnel dedicated to air superiority. An Airman assigned to the 432nd Wing/432nd Air Expeditionary Wing speaks on the MQ-1 Predator and the MQ-9 Reaper displayed at the 2017 Aviation Nation Air and space Expo, Nov. 11, 2017, at Nellis Air Force Base, Nev. The event showcased some of the Air Force’s premier aircraft and personnel dedicated to air superiority. 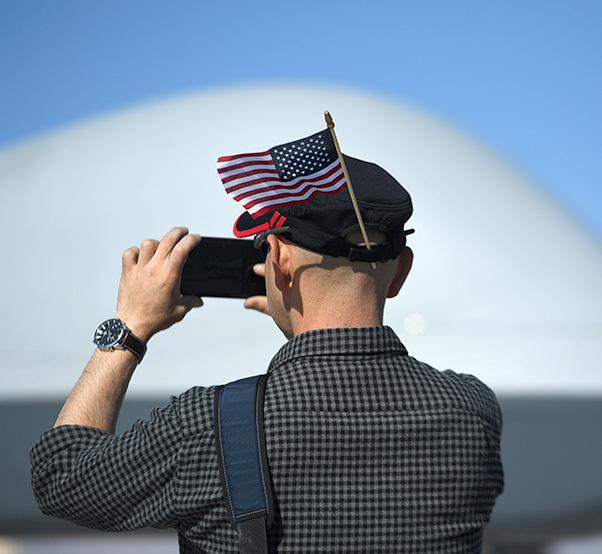 An attendee takes a photo of the MQ-9 Reaper at the 2017 Aviation Nation Air and space Expo, Nov. 11, 2017, at Nellis Air Force Base, Nev. More than 165,000 people attended the two day event showcasing America’s airpower.